A man collapsed and stopped breathing in San Luis Obispo Monday afternoon, but friends of the victim performed CPR and helped resuscitate him. The victim, who is unidentified due to HIPAA rules, collapsed while walking with family friends in the 800 block of Humbert Street. The friends witnessed the collapse, immediately began performing CPR and called 911, according to the San Luis Obispo Fire Department. When paramedics arrived, they took over the emergency care and began using a defibrillator. Soon after, the victim’s pulse returned and he began breathing spontaneously. An ambulance transported him to French hospital, where he remains in stable condition. 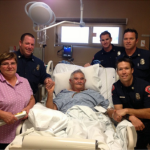 San Luis Obispo Fire Chief Garret Olson credits citizen-performed CPR and prompt paramedic response with saving the man’s life. Subjects: San Luis Obispo San Luis Obispo Fire Department Science! Such a great news story! Thank you CCN! What a nice story. This is what we should be reading in the news, not about corrupt politicians and dirty campaigns!